Here’s the three steps to add Google Maps Public Transport directions to your website. If Google has public transport for your event’s location.. Great!! Then go to the Example (step 2) below. If they don’t have public transport for your event’s location. It might be because your public transport provider has not yet provided Google the data in the correct format. We suggest you contact your public transport provider and suggest they get their data on Google Maps. If they don’t know how or need help, tell them about AddTransit or send them a link (https://addtransit.com) and we can help get their public transport (ferries, buses, trams and trains) onto Maps. Here’s an example of it could look. We’ve used “Times Square, New York” as the event destination. Try entering Boston, MA as the starting address…..
Here’s the code that you will need to add to your website. You’ll need to modify the “Times Square, New York, USA” to be the address of your event. Publish the updated webpage and that’s it! Done! Hope that helps and let us know if you have any questions. One of the great things about the advent of Google Maps is the ability to get not only only driving directions but also public transport directions. 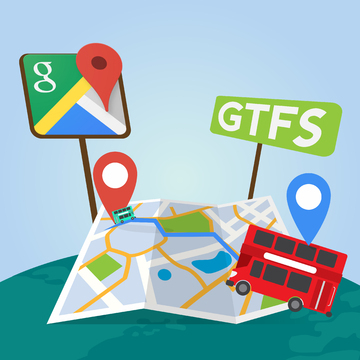 Google uses GTFS (General Transit Feed Specification) files from the bus companies to display bus routes, bus schedules and calculate bus directions. A passenger just needs to enter their start location and their final destination into Google Maps and choose the public transport icon. Google then shows the passenger the public transport options. The bus route is shown on a map and alternate travel routes (if available). Further drill down options exist to allow the passenger to see the schedule, alternate trip times, basic fare information and transfer details. The ubiquitous 24×7 nature of Google maps bus directions, means that wherever there is access to the Internet (e.g. PC, tablet or smartphone, etc.) a passenger can plan their journey. No more out of date paper time tables and complex journey planning! Additionally, if your journey destination changes midway you can recalculate an alternate route in moments and get there faster. Transit Driver Appreciation Day: Thank You From AddTransit! Transit News Roundup - AddTransit Blog on Is Your Bus Company Ready for Mothering Sunday?